See a Dual Motion linear actuator in action to fully understand what dual motion means and see a few examples of applications. The Haydon Kerk™ 43000 Series (Size 17) of dual motion actuators are available with a limitless number of operating parameters allowing each device to be custom manufactured according to customer specific application requirements. Linear motion can be optimized based on a variety of lead screw resolutions yielding linear travel ranging from 0.0015mm to 0.0487mm per step. 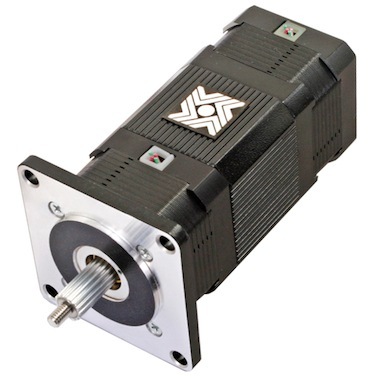 Rotary motion is achieved with either 1.8° or 0.9° step angle motors in both single and double stack.